This recipe converted to gluten-free really well the first time, after tweaking it only a small amount I think we’ve got it perfect. 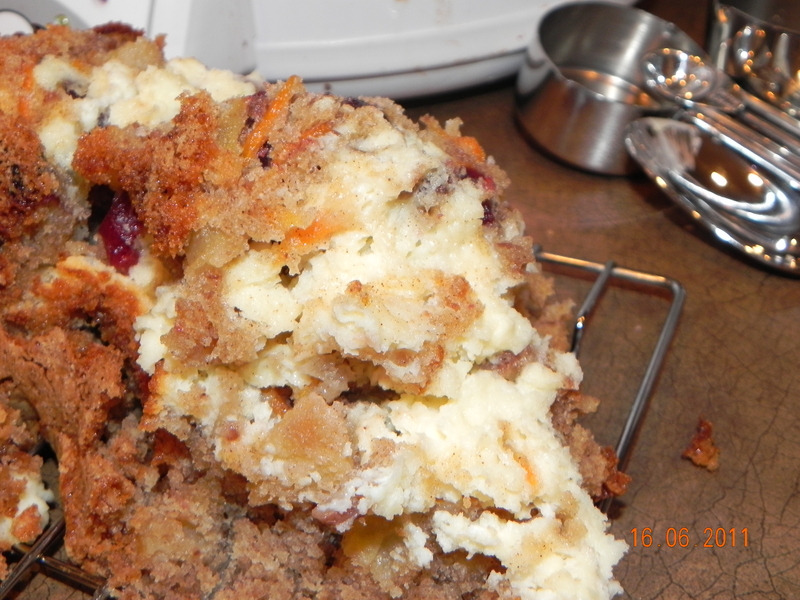 The next time I make this cake I’ll get pictures for you, but for now just know that it was so good that it disappeared before my camera left its case. In a small bowl, beat cream cheese and 1/4 C sugar until smooth. Beat in 1 egg; set aside. Preheat oven to 350F grease and flour a 10-in bundt pan. In a large bowl, beat oil with remaining sugar and eggs until well blended. 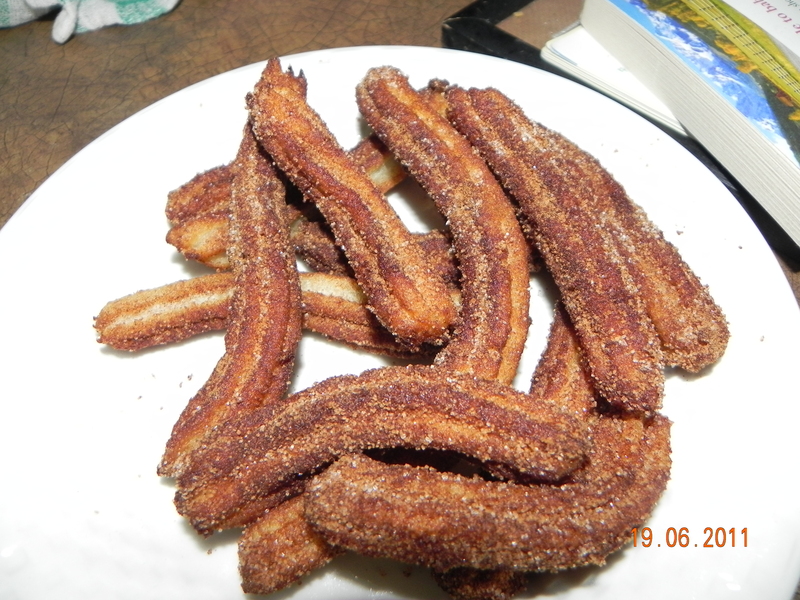 In a separate bowl, combine the flour, xanthan gum, baking powder, cinnamon, salt, and baking soda. 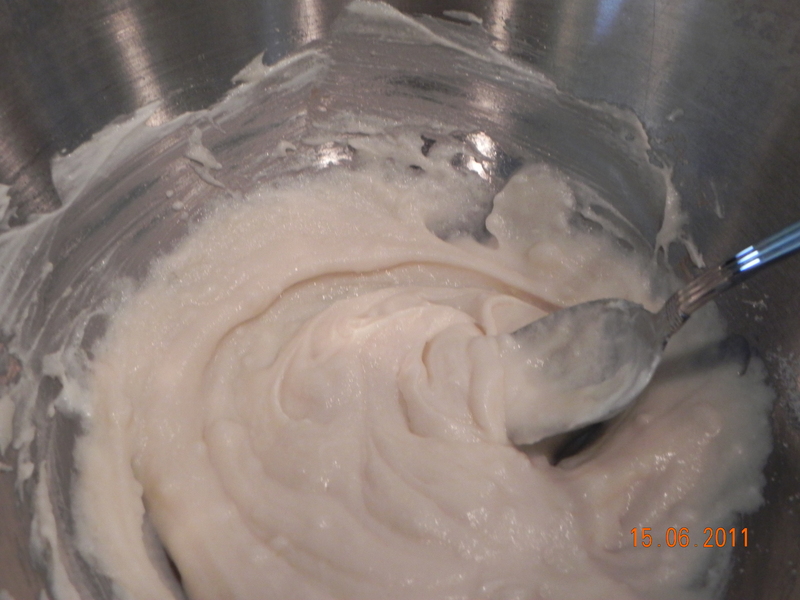 Gradually beat the flour mixture into the oil mixture until blended. Stir in the apples, raisins, carrots, and pecans. Transfer half the apple mixture to the prepared pan, layer with cream cheese mixture and top with remaining apple batter. Bake for 55-65 minutes, until a cake tester comes out clean. Cool for 10 minutes, or until the pan is cool to touch. Turn out onto a wire rack to cool completely. Before having children, I’d see a little child throwing a tantrum in a store and shrug, “It must be the terrible twos”. Later, while expecting our first, I’d see a child kicking and screaming and I’d cringe. With fear I wondered if there was a way to skip the years one through five. Then we had our baby. Everything changed. No longer did I fear the child. Things weren’t always easy, but it was easy to see that those moments of crying, kicking, and screaming were usually preventable, or at least easily mitigated. What? Obviously I must have spoiled children that’ll never learn to listen and will be ten times worse as they get older. Right? Wrong. By saying ‘yes’ as much as possible we actually achieve exactly what we want. Our children are able to listen when we do say ‘no’. 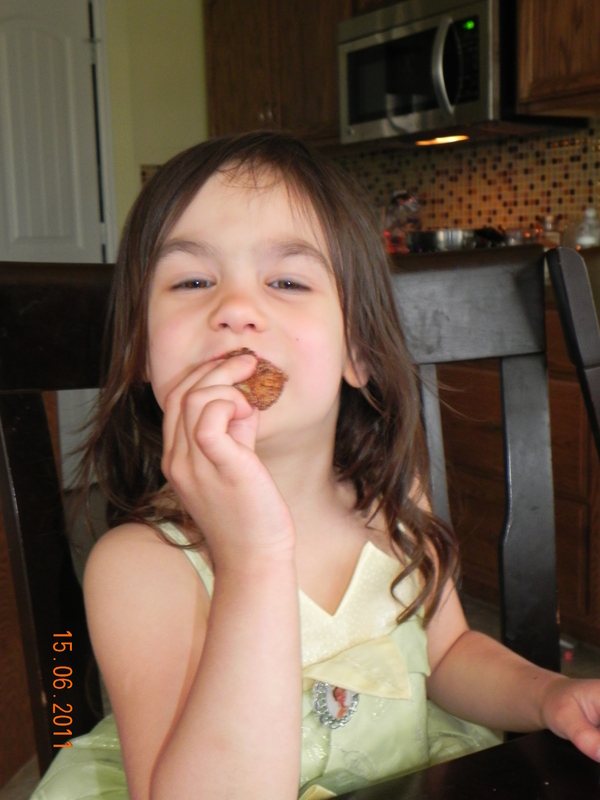 We also allow our little ones the opportunity to explore their world safely and learn their own personal limits. We provide ourselves with peace of mind knowing our children won’t try climbing something completely beyond their skills. It also provides our children with the knowledge that if they need help, they can come to us for help, and know we won’t automatically tell them no. When our girls learned to roll and crawl, we gated anything that wasn’t safe. We never had to ‘no’ them away from something. As they learned to climb, we bolted cabinets and bookshelves to the walls. Even if they pulled on them, the shelves weren’t going any where. We put the fun stuff on the lower shelves so they were less likely to climb higher, and we had pillows below in case they did. Our girls have fallen, they’ve been bumped and bruised, but each time they fall they learn something new. When out, we give them the freedom to run as much as possible. Before they run off we tell them our expectations: “They can run, but must stop when we say stop, and come back when we call.” We also tell them what happens if they don’t: “Then the must walk beside us.” If they don’t stay beside us, then we hold hands. If they won’t hold hands, then we leave. It doesn’t matter where we are, we leave. It only took me leaving a place once or twice before they got the message. I was willing to leave without the milk we needed in order to keep them safe, and me sane. I don’t need to nag, hit, give time-outs, or otherwise punish them. They’re very good at keeping themselves in check and watching each other. The days where someone has an unmet need are the most difficult. A tired, hungry, thirsty, hot, or cold child will not be able to regulate as well as one with all needs met. If we find ourselves out and about when circumstances are less than ideal, we have extra patience and keep instructions simple. A tired child will be less able to keep up, a thirsty child may ask for something and scream when told ‘No’. It isn’t a child’s way of trying to get everything they want, but rather the child’s way of communicating. Until four or five (even later in some children) a little person can’t tell us why they feel so horrible, some might not even realize they do, until one more thing happens. A three year old is hungry (or any other need), but doesn’t realize it, she asks for a piece of candy at the check-out in the grocer. Mom says no. She starts to whine, cry, followed by a full melt-down as mom holds firm. If the need had been met, then the situation could have been prevented. If mom knew her daughter was hungry, then she could have offered: You can’t have that candy because…(fill in with reason of choice), but you can have a banana or a slice of cheese. By offering something, your child knows you’ve heard them and understand their need, even if they don’t. Even if your child doesn’t want your offering, you’ve opened the gates to communicating, the melt-down is postponed or cut off completely, and you have the opportunity to talk to your child. And this is the key. If you dictate rules to your child, they will push them. But if you offer a rule, followed by a valid reason (“Because I said so” is not a valid reason), your child is more likely to listen. We also allow the opportunity to discuss the rules and other options. We have back-tracked and changed our minds after talking to our girls. This is not being a push over or sending the message that they can ‘get away’ with something. Rather we send the message that we’re open to discussion and if they don’t like what we’ve said they can talk about it. We may change our mind, we might not, but we will listen to their side of things. And last if nothing else can be done and crying or yelling happens, let your child know you love them, and move on. I’ve hugged the girls in full tantrum, let them know I love them, told them I will not let them hurt myself or others and have carried them kicking and screaming to the car when that was the only way I could keep everyone else safe. When they calm down, I hug them again, let them know I love them, and offer to talk about it if they want. Sometimes they do, sometimes they don’t either way I respect their choice. These are things we’ve used from the moment the girls were able to move on their own. We explain ourselves and we demonstrate when needed. Even before they have the words, they can understand, and what they don’t understand one time they figure out quickly enough. Father’s Day, a day to remind ourselves of the wonderful things fathers do for their wives and children. Here is a wonderful post I read recently and thought I’d share with you. I’m happy to report that my husband is fully ‘awake’ according to this dad. About the only thing Ryan doesn’t do from this list, is wake the girls up while they’re sleeping – maybe in a few years, but not now. Well, unless you count vacations, when we have places to go etc. When home, Ryan gets up in the morning with the girls, and lets me sleep. He’s even, once or twice, gotten up at night with them when they’ve woken and needed something. He does occasionally do something fun for himself, but more often than not, he’s home with us when he’s not working. He changes diapers, and helps with pottying. He plays with dolls, has let the girls paint his toes, and even told anyone who said anything about it to bugger off. Pink toenails and little girls that know their daddy loves them were more important that whatever his brothers thought. I’m sure he does things he doesn’t want to do, but he’s pretty good at hiding it, so I don’t think the girls notice. When he’s home he’ll watch all three girls while I go for a walk with my sister. Or grocery shopping, or clothes shopping, or to the fabric store. And once upon a time, before we had a baby needing to eat every two to three hours, he’d watch the girls while I wrote, or went to work. I really hope he’ll figure out how to clean the bathrooms or wash the floors, but for now I’m happy with him folding laundry and doing the dishes. That’s thirty minutes or more a couple times a week where I can re-charge for the week ahead. He gives the girls hugs and kisses and tells them he loves them. He tickles them, chases them, reads to them and generally spends a lot of quality time with them. Today, we’re sitting down together and watching “Gnomeo & Juliet” together as a family. Fishing over the side of the second floor railing (catching dollies on the first floor), watching the third day of rain pour down outside our window. And loving life. I am truly blessed to have found a man that loves his family enough to play with his children and to help his wife. I couldn’t ask for more. Yesterday was our seventh Anniversary. Each year I’ve grown to love my husband more than the year before. Each year I’ve enjoyed with Ryan more than any other time. From what I can see this next year will continue that trend. Life gets better all the time. In a large bowl, combine potatoes, sugar, egg, sour cream, and vanilla. In a separate bowl, combine dry ingredients, mix well, then stir into potato mixture. 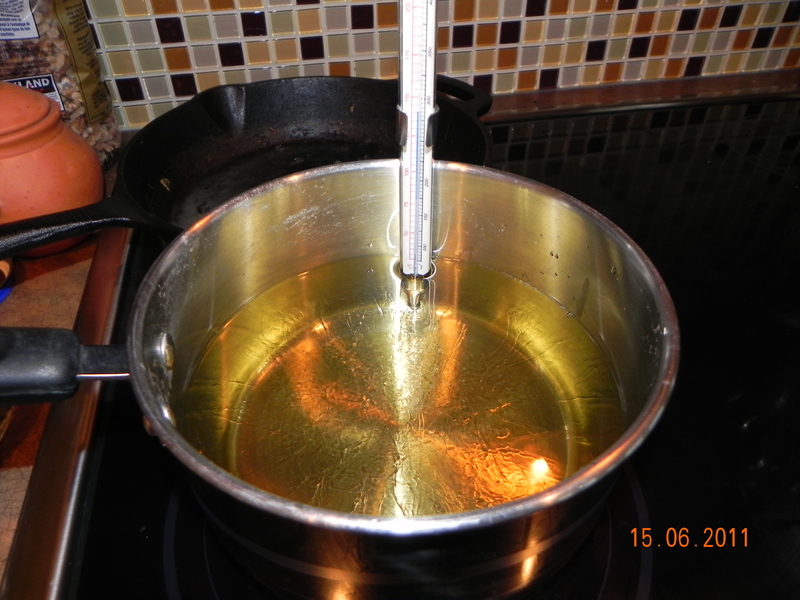 Heat oil in an electric skillet or deep fryer at 375F. Or if you’re more basic, like me, fill a heavy saucepan about half-full with oil, then using a deep-frying thermometer, heat to 375. 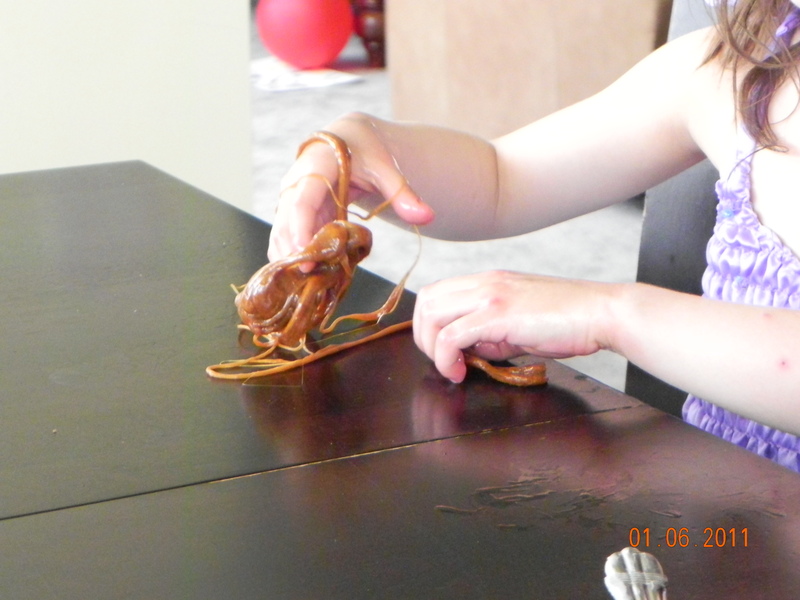 Fill a piping bag, with a large tip affixed, and pipe small strips of batter into oil. Be sure to keep your tip close to the oil so there’s less risk of splatter. Fry until golden-brown on all sides, about four seconds. Drain on paper towels, roll in sugar while still warm. 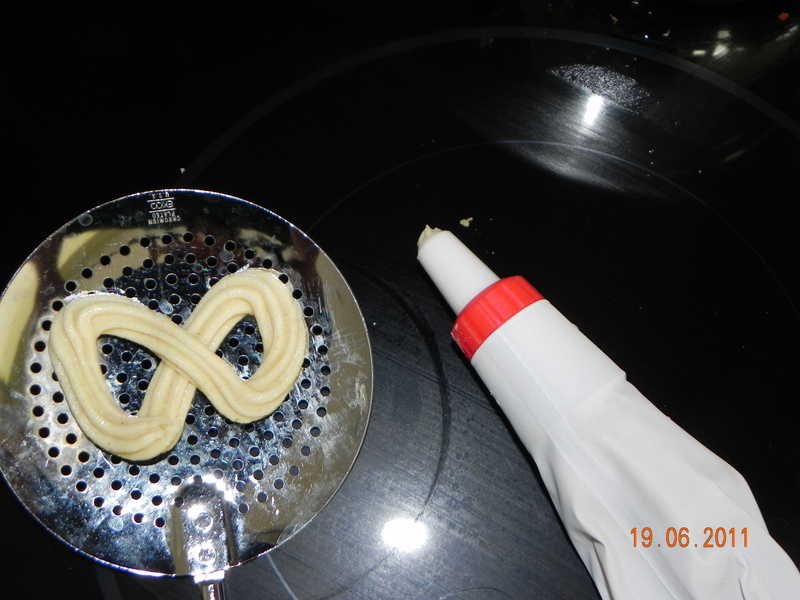 I’ve tried dropping by the teaspoonful into the oil, but couldn’t get the center cooked before the outside burned, piping certainly resulted in the tastiest treat. Ella is…exuberant. Her motto is why walk, when you can run, and why run, when you can do cartwheels? Everything is a mile a minute when she’s happy…and when she’s upset, overwhelmed, tired, hungry or has any other external stimulus. The more excited she gets, the faster she goes. She can’t calm down. She doesn’t know how, and to date we haven’t figured out how to help her. But recently we did find a solution when she was playing with her new best friend, J, the boy next-door. He wanted to sit in the boat (box) and drive it, she wanted to crash into the boat and sink it. He wasn’t having fun, she was. Her laughter danced across the sunlit backyard, warming us. He kept looking to me. I suspect he wanted me to tell Ella to stop. But I didn’t. I also don’t think I should have. I believe it would make the immediate situation worse (due to her reaction) and I believe the long-term friendship would suffer. Did I just let her continue? No. I walked over and squatted down to their level. I inquired if they were having fun. Then told them what I saw. In the end I offered a solution they both liked: J would drive a boat and feed the dolphins fish. Ella would be the dolphin jumping for fish. It took a few moments talking to them both before they figured out, together, what the rules would be while playing together. I never dictated to them, they were involved in the decision making from the start. Also no one got in trouble. They continued playing for the next twenty minutes without needing anyone to help them. They had the tools they needed to figure things out for the rest of their playdate. I’m sure other situations will arise, but a similar approach will help the two friends learn how to play together respectfully. Life is busy, as always. The exterior of our house is almost done. Once it is, the rough grade can be completed, the final grade, and GRASS! In the meantime we have clay sprinkled with rusty nails. Ella is unimpressed, to say the least. She wants to roll in the dirt. She wants to dig, she wants the freedom to do as she pleases. 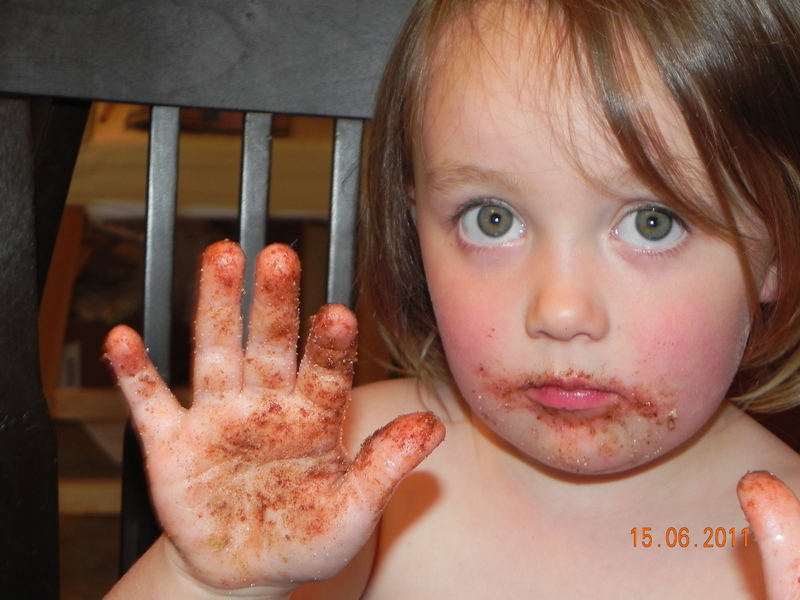 Unfortunately, her paranoid mommy insists she must wait until we get topsoil. At the rate we’re going that’ll be sometime in August. While we wait for the builder to finish their work, I’m planning. Decking, fencing, patio, trees, shrubs, shed, planting area. I’ve drawn out my plan a few times and think I’ve figured most of it out. Of course it’ll take several years to get it all done, but I’m excited. We’re also slowly getting our house in order. Ryan’s home for a few days and plans to clean out our garage enough to determine if my van will fit or not. Ella has two more sportball classes to attend, she’ll be so sad when it’s over. On a brighter note she just started swim lessons and loves them. Our little girl willingly gets her hair wet, and puts her face in the water. This summer she has a couple camps to attend – a fairy one and groovy girls. Agatha’s class will be over shortly as well, though I think she’ll be much more upset than Ella is about hers. She’s loved her weekly ‘class’ where she goes off on her own to play with other kids, sing, do crafts (or at least do exactly what someone else tells her to do with the medium of choice), and run around. After her birthday she does have a couple other camps as well. A bike riding camp and a playground camp. She’s excited about them. Mommy, Take My Picture Please. Little miss Cordelia is wiggling everywhere and cooing up a storm. I’ve seen her roll. Nice, slow, controlled. No startling involved, however, she’s only done it twice. When on her tummy she gets her knees and elbows working and crosses the room – at least until her sisters block the way. 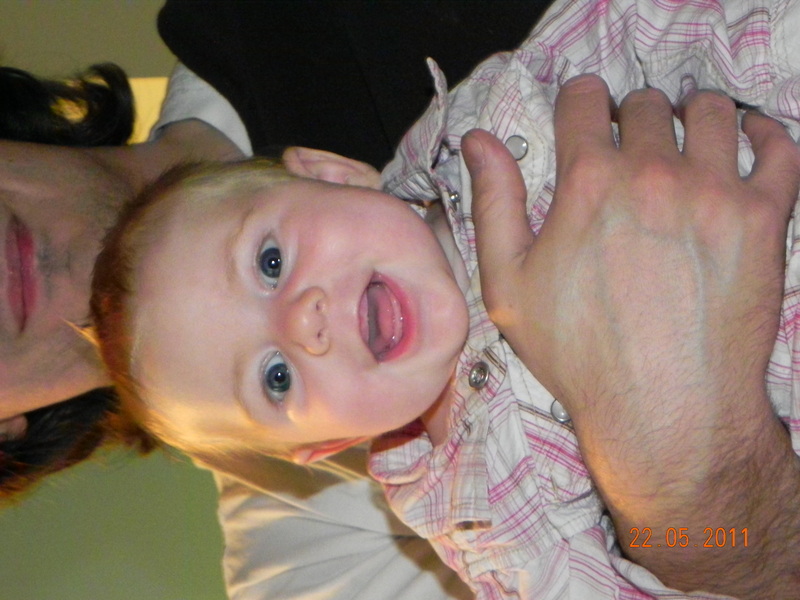 Oh and she’ll have her first (and likely second, third, and fourth) tooth soon. 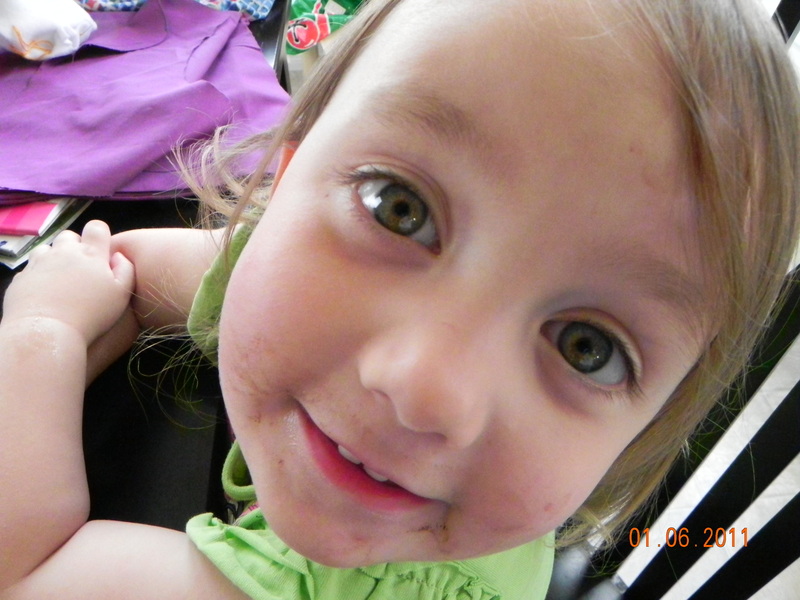 Her gums are widening with the little red spots on top that indicate a tooth is just below the surface. The amount of drool coming out of this baby is amazing! Ryan’s painting up his armies to play Warhammer, but mostly he’s working. I’m irritable, tired, cranky. And most days feel miserable. I’ve given up all pretense of having a clean house. Instead I focus on spending happy time with the girls, or taking the time to have a tea or coffee. I’m having a tough time being present for the girl’s but we are truly blessed with little girls who know they can tell me when I’m out of line – and they do. We’re working on finding balance and I’m sure all the ladies in our new neighbourhood must think I’m nuts, but that’s okay. All my friends already know I am. I’m not sure who enjoyed our day more, the girls or me. 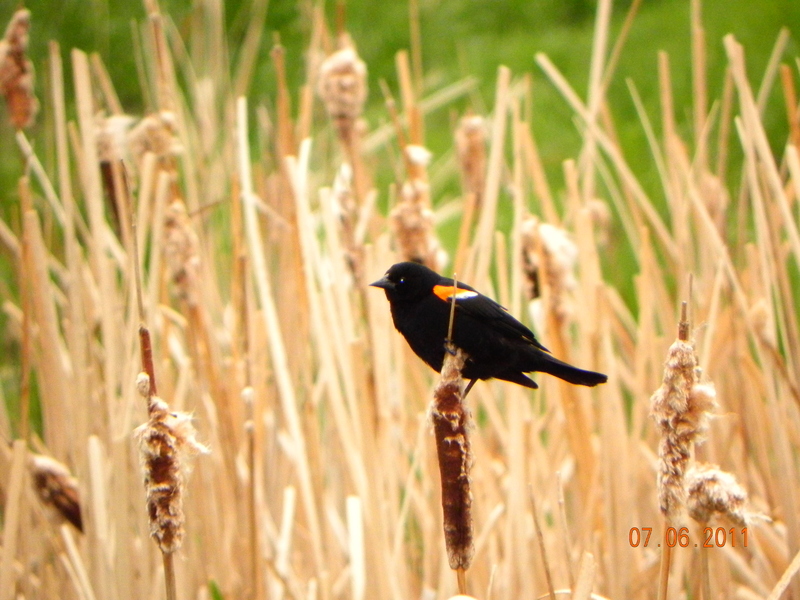 As we crossed the bridge and came to the look-out we saw red-winged black birds. 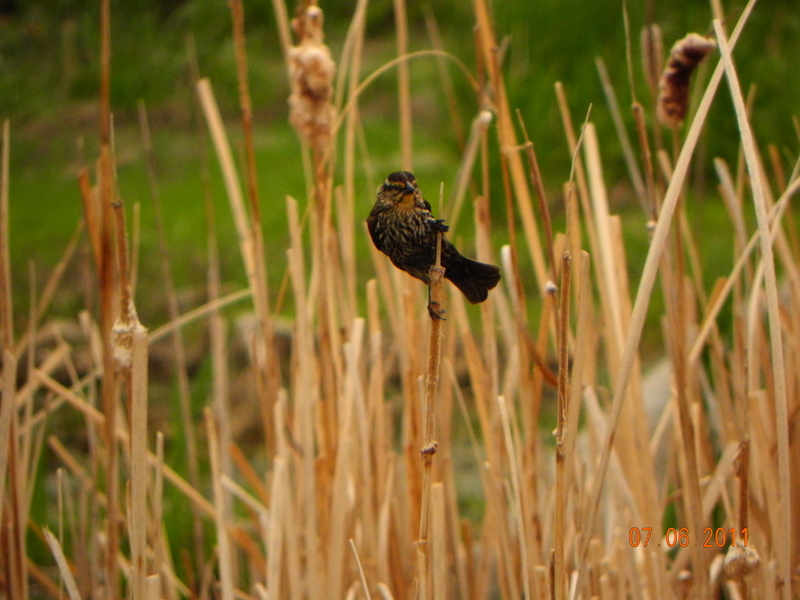 Both male and female birds actively protected their nest. The male dived at Ella as she came too close to their reeds. 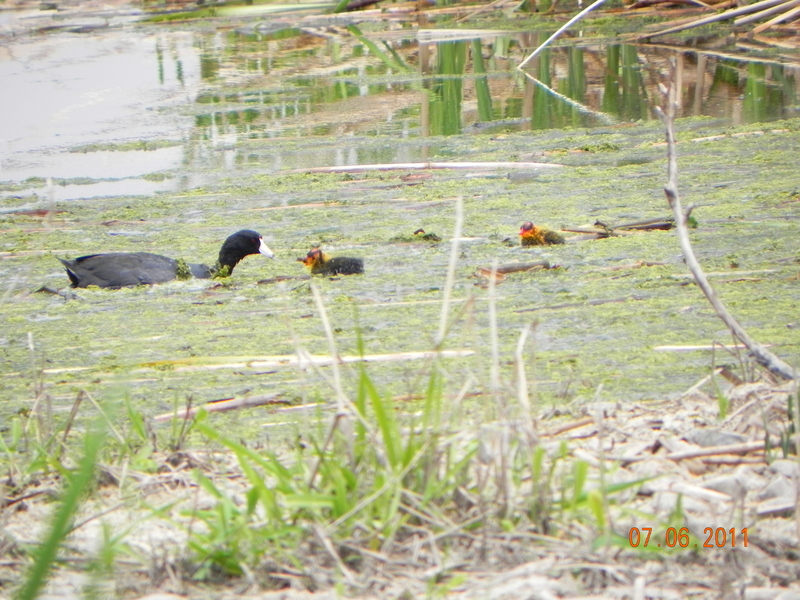 Next we saw an American Coot family with seven little chicks. I was very excited. I’d never seen a coot before, only heard of them. Now I know what they look like. We also met an older couple who told us they always called them Diving Devils, and had never heard them called coots before. We also saw two muskrats fishing and a pair of Canada Geese and a mallard family with eleven ducklings. The girls liked them best. I think it’s because they’ve seen them before and knew what they were on their own. There were also Purple Martins, we all thought they were gorgeous birds. Ella found a snail shell and checked out the different reeds. 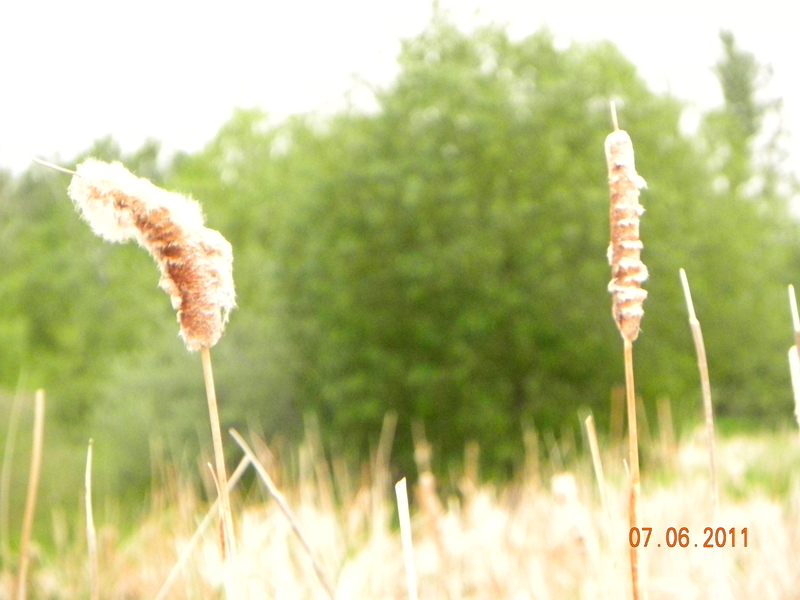 She noticed the difference between the fresh green reeds, the tall brown reeds, and the reeds piled along the shore. She waded into the muck to see what she could find, though without a net or jar she didn’t find much. We stopped to smell the wild roses and admire the tiny blue flowers we determined, with the help of the older couple, must be flax. The girls saw a bush covered in rose hips and wanted to know all about them. The girls are looking forward to going back next week to see what else we might find.I’m looking forward to getting more pictures. In parting here’s my favorite shot for the day and one of my favorite poems, our day reminded me of it for so many reasons. But how he set, I know not.